When performing an infrared inspection, obtaining quality data relies on the use of proper equipment, thermographer training and knowledge of the system being inspected. It is imperative that a thermographer be familiar with the construction and operation of the object(s) to be imaged before the inspection begins. 1. Become familiar with system construction by reviewing appropriate drawings or blueprints noting insulation materials located on, or within, the subject system and how they might impact findings. 2. Discuss with the end user the reason(s) for conducting the infrared inspection. 3. Review any previous inspection reports and operational data to determine history of the subject system including past problems. 4. Ascertain that the system is under normal operating conditions and how its operation is likely to affect thermal signatures. 5. Ensure that line-of-sight access is available and that environmental conditions and infrared equipment are appropriate for collecting accurate data. 6. Determine if a similar system is available for reference purposes. Following the above can vastly improve the quality of collected data and help to reduce errors in reporting. As always, remember to work safely. Because it is usually less confusing than multi color palettes, grayscale may be better suited for some applications. Additionally, applications that have a large delta T associated with exceptions or where target recognition is important may be better suited for grayscale imaging. Such applications include electrical distribution systems, building envelopes inspected from the interior of the structure, and low slope roof inspections. Multicolor palettes offer an advantage when imaging targets having a small delta associated with exceptions or when imaging targets with several discrete temperature zones. Typical applications include mechanical systems, refractory systems, building envelopes inspected from the exterior, and medical/veterinary applications. With tremendous emphasis placed upon the sophistication of today’s modern thermal imagers, it’s easy to forget the basics of thermal imaging. Regardless of imager age or sophistication, there are several basic concepts that can vastly increase the accuracy and success of an infrared inspection. 1. Select the proper spectral response imager for the application. 2. A clear line of sight to the target is required with no obstruction of the imager lens. 3. Imager optics must be clean and calibrated to the imager being used. 4. Target should be dry and at a stable temperature. 5. Imager focus is imperative to accurate diagnosis and temperature measurement. Be sure to focus imager and the viewfinder as well. 6. Knowing the construction, operation and characteristics of the system being inspected is vitally important to anticipating thermal patterns and performance. 7. Adverse atmospheric conditions such as wind, humidity, or solar reflection and solar loading should be avoided. 8. For electrical and mechanical equipment, the systems must be energized and under load; for structural inspections, a delta T of 10 C (18 F) is desired. 9. Discriminating small temperature differentials across targets with low emittance values can prove quite difficult. 10. Whenever safely possible, cross reference observed infrared temperature values with accurate contact temperature readings. When performing any infrared inspection, be certain to take all necessary safety precautions and always work safely. With the advent of digital storage media, nearly every modern thermal imager is capable of storing images electronically. 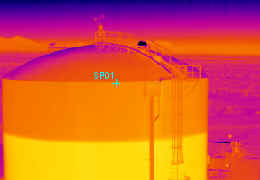 For thermal imagers that do not have image storage capability, there are inexpensive and readily available solutions. For thermal imagers having a video output jack there are two options for image storage. The first option utilizes a VCR to record desired imagery. Videotape allows for recording of moving objects and/or dynamic processes. Videotape is inexpensive, readily available, and special equipment is not required for playback. Still images can be captured from videotape using a video capture board available for most personal computers. The second option utilizes a digital recorder that accepts a standard video input. With a digital recorder, single frames of data may be captured to digital media such as PC cards. Camcorders having a digital snapshot camera feature may provide the best solution of all. Several currently available models allow a thermographer to record to videotape and/or to capture still images from the video input. Additionally, the daylight snapshot feature of the camera may be used to capture high quality daylight images. Once images have been recorded, they can be directly imported into a PC for storage or incorporation into written reports. When it comes to providing a stable platform for a thermal imager, it’s hard to beat a tripod. As thermal imagers have gotten smaller and lighter, many thermographers have all but forgotten this once requisite accessory that can help provide better quality data while reducing stress. 1. Be sure to select a tripod capable of carrying the weight of your imager. 2. Tripods should connect directly to the imager via a 1/4” x 20 set screw. Tripods with plastic quick releases should be avoided as they are subject to wear and can cause an imager to suddenly fall. 3. Tripods with sturdy hardware and locking systems are more secure and generally last longer than inexpensive models. 4. Fluid head tripods are preferable since they provide smooth motion for videotaping and are less likely to drop an imager if the head is left unlocked. When carrying a tripod be sure to maintain a safe distance from energized electrical equipment or moving machinery. Electrical bus ducts are a common feature found in many commercial and industrial electrical systems. When used to supplement regular PM, infrared inspections can help to detect loose or deteriorated connections that can lead to costly failures. Concrete Masonry Unit (CMU) walls are a common construction detail frequently used in single –story and low rise commercial block wall construction. An infrared imager can be used to quickly perform quality assurance inspections of reinforcing grout details which are critical to the strength of finished CMU walls. During the construction of CMU walls, concrete grout is used to fill the cavity spaces of the blocks in order to provide structural integrity. Vertical details extending from the foundation to the top of the wall are usually placed at regularly spaced intervals along the length of the wall. Reinforcing grout is also placed around openings for doors and windows or in areas where extra wall strength is required. Because grout details change the thermal capacitance and conductance of the wall, temperature differentials will occur wherever grout details are present. Infrared inspections may be performed under solar loading, heat loss, or cooling conditions depending upon local climate and time of day. Properly installed grout details will appear as uniformly cool or warm unbroken lines in the subject wall areas according to time of day and whether the inspection is performed from the interior or exterior of the building. UPS systems and emergency generators are common defenses for facilities where uninterrupted electrical power is critical. Performed properly, IR inspections can help to improve reliability of emergency power systems. Inspect all backup generators while running. Begin inspection at generator output leads and proceed to generator bus, breakers, and switchgear. Include all Automatic and Manual Transfer Switches. Inspect switches in both normal and emergency positions. Inspect UPS system controls, switchgear, battery cells, battery bus and wiring. Battery cell temperatures should be the same between cells with no hotspots on individual cells. Have adequate load on the subject emergency circuits This may be accomplished with normal facility load or by utilizing a load bank. Taking the time to properly include your emergency power equipment in your IR inspection program can pay huge dividends by increasing the likelihood that your backup equipment won’t leave you in the dark should the power fail. Unknown emittance values are often the greatest error source when taking infrared temperature measurements. This error source can be eliminated by modifying a target with a material having a known E value. Some of the modifying materials that thermographers commonly use include flat-finish spray paint, PVC electrical tape, masking tape, and spray deodorants containing powder. Make sure that it is safe to contact the subject equipment. Obtain permission to modify the surface from the end user. Ascertain that the selected modifying material will not melt, catch fire or emit toxic fumes when heated. 1. Place radiometer at desired location and distance from target. Aim and focus. 2. Measure and compensate for Reflected Temperature. 3. Apply a surface modifying material having a known E value on target making certain that material is in full contact with target and there are no air pockets. Modifying material should be larger than radiometer’s spot measurement size for the chosen distance from the target. 4. Enter E value of modifying material into radiometer’s E setting. 5. Measure temperature of modifying material once it has reached thermal equilibrium with target. 6. For greater accuracy, repeat measurement three times and average the results. For more information on the above technique, refer to the Infraspection Institute Guideline for Measuring and Compensating for Reflected Temperature, Emittance and Transmittance available from Infraspection Institute. FRC is only effective when it is worn properly. It should always be worn as the outer-most garment. If worn over other layers clothing, the undergarments should be made of natural fiber and completely covered by the FRC. Before wearing FRC, be certain to understand its proper application and limitations and how to use it properly. As always, remember to work safely! Glass viewing windows and plastic safety barriers are common features found on medium and high voltage electrical enclosures and devices. Although glass and many plastics are transparent in the visible spectrum, they are opaque in the infrared spectrum. If barrier is short and the subject device is connected to insulated conductors, image conductors and report any inexplicable temperature rise. When safety glass view ports are encountered in switchgear enclosures, it will be necessary to have the qualified assistant open/remove the subject panels. If this cannot be done due to safety interlocks, other types of electrical testing should be performed during regularly-scheduled PM shutdowns. As always, any obstructed equipment or equipment not inspected should be noted as such in the final written report. When working in a new facility or plant area for the first time, you may encounter safety rules that are new or different. It is always a good idea to review safety requirements with the project manager prior to project start to ensure that you are prepared. What general safety training and/or site specific training is required? Is special clothing, shoes or other Personal Protective Equipment required? Can infrared and related test equipment be used in the subject areas? Are respirators or additional safety equipment/monitors required? Will the work involve hazardous locations such as confined spaces, scaffolding or elevated platforms? What medical conditions might preclude a person from working in the subject area(s)? Are there site specific emergency procedures including evacuation, designated rally spots and how to report an incident? Once the project commences, be sure to maintain good situational awareness and always stay with your qualified assistant. Becoming familiar with area safety rules in advance of a project can help to avoid cancelled projects and embarrassment while helping to maximize safety. When performing infrared temperature measurements, reflected infrared energy can be a significant error source. This potential error source can be overcome by using the proper radiometer and test procedure. All thermographers have experienced reflected energy when inspecting low emittance targets. For qualitative imaging, single-point reflections may be avoided by changing viewing angle. With quantitative imaging, failing to compensate for reflected energy can account for significant measurement errors. The infrared energy received by a radiometer is the sum of emitted, reflected and transmitted energy (E+R+T=1.0). For targets with a transmittance of zero, the error sources are emittance and reflectance. Using a quality radiometer, reflected energy can be measured and compensated for by using the Reflector Method described below. 6. Enter value obtained in Step 5 into radiometer’s computer under reflectance input – commonly labelled Background, TAmbient, or Reflected Temperature. Be sure to maintain a safe working distance from any energized or potentially dangerous targets. For more information on this subject, refer to Infraspection Institute’s Guideline for Measuring and Compensating for Reflected Temperature, Emittance & Transmittance. Taking your infrared imager into dusty or wet environments can have disastrous consequences for your imager. While it is best to wait for such conditions to subside, your can use a polyethylene sheet or trash bag to temporarily protect your imager and accomplish a qualitative inspection. Since not all imagers and trash bags are created equal, you can follow the following steps to ensure good results. 1. Set up imager looking at thermally stable target with a high emittance. If using an imaging radiometer, note the apparent temperature of the target. 2. Select a clean, unused, polyethylene trash bag with a uniform thickness. 3. Open trash bag and place over imager. Use only a single layer of the bag plastic to cover the lens. 4. Use a rubber band to keep plastic smooth and wrinkle free over the imager lens. 5. Image target in Step 1 again and note image quality and apparent temperature. 6. Repeat above steps using different brand bags and thicknesses until you find a bag that gives minimal attenuation of image and apparent temperature. 7. After selecting the bag that works, trim to fit imager so as to prevent a tripping hazard. If your imager requires air cooling, leave the bottom of the bag open so the imager can ‘breathe’. 8. When finished imaging, remove bag from imager and discard. While not glamorous, this procedure can allow you to successfully perform a qualitative inspection in an environment that might otherwise harm your imager. For more information on specifying an infrared imager, refer to the article, “Selecting, Specifying, and Purchasing a Thermal Imager” which may be found on this website here. Lastly, the greatest limiting factor in any infrared inspection is the thermographer. For accurate results, infrared inspections should be performed by properly trained and certified thermographers. For more information on training, please contact Infraspection Institute. For the past decade, the document, NFPA 70B Recommended Practice for Electrical Equipment Maintenance, has recommended annual infrared inspections of electrical systems. The 2002 edition of NFPA 70B contains several revisions of which thermographers should be aware.